other means/mode of application will be accepted. CAT 2014 Exam Pattern- IIMs have announced the new exam pattern of CAT 2014. Several changes have been made in the CAT 2014 Exam Pattern. The number of questions have been increased from 60 to 100. The duration has increased by 30 minutes and there is no sectional boundary as well unlike last year. The total duration of the exam is 170 minutes or 2 hours and 50 minutes. Last year, the duration was 140 minutes or 2 hours and 20 minuted. Hence the duration of CAT 2014 has been increased by half an hour. Unlike past years, the sections are no more time bound and the candidates can switch between the sections as well which was not possibl till las year. There are 2 sections in CAT, Quantitative Ability & Data Interpretation and Verbal Ability & Logical Reasoning. Before CAT 2011, there were 3 sections, Quantitative Ability, Verbal Ability and Data Interpretation & Logical Reasoning (not in exact order). CAT 2014 onwards, though the number of sections would be 2, they would not be time bound. The candidates would also be able to switch between the sections which was not possible till last year. The total number of questions in CAT 2014 has increased from 60 to 100. Till last year, each section had 30 questions but from now on, there would be 50 questions in a section. Before CAT 2010 also the total number of questions was 60 but since the number of sections was 3, each section had 20 questions. All the questions are multiple choice and objective type in nature. Each question carries 4 options. Each correct question in CAT 2014 is awarded 3 marks. Hence the total marks of CAT 2014 would be 180. There is 1/3 negative marking scheme. Hence for each wrong answer, 1 mark would be deducted from the obtained score. All the questions are not compulsory to attempt. For the unanswered questions, 0 marks would be given, i.e. there would not be any negative marking for unanswered questions. The number of test cities has also increased from 45 to 99 this year. The New India Assurance Company Ltd., a leading Public Sector General Insurance Company & wholly owned by Government of India, invites applications for recruitment of 509 (Five Hundred Nine) Officers in Scale I cadre from open market. Emoluments & Benefits Basic pay of Rs.17,240/- in the scale of Rs.17,240-840(14)-29,000-910(4)-32640 and other admissible allowance as applicable. Total emoluments will be approximately Rs.36,000/- p.m. in Metropolitan Centers. Other benefits such as Pension under New Pension system governed by PFRDA, Gratuity, LTS, Medical Benefits, Group Personal Accident Insurance etc. shall be as per rules. The Officers are also entitled for Company‟s / leased accommodation as per norms. The salary scales are under revision with effect from August 2012. · IIT Guwahati is the Organizing Institute for JAM 2015. · JAM 2015 Examination will be conducted ONLINE only as a Computer Based Test (CBT) for all Test Papers. i. Multiple Choice Questions (MCQ) : Each MCQ type question has four choices out of which only one choice is the correct answer. ii. Multiple Select Questions (MSQ): Each MSQ type question is similar to MCQ but with a difference that there may be one or more than one choice(s) that are correct out of the four given choices. iii. Numerical Answer Type (NAT) Questions: For each NAT type question, the answer is a signed real number which needs to be entered using the virtual keypad on the monitor. No choices will be shown for these type of questions. · All candidates have to apply only ONLINE. · NO hardcopies of documents (except challan) are to be sent to the Organizing Institute. The documents (if applicable) are to be uploaded to the online application website only. · No hardcopy of JAM 2015 score card will be sent to the JAM 2015 qualified candidates by the Organizing Institute. It can only be downloaded from JAM 2015 website. How to apply for JAM 2015? CAT 2014 new pattern of test will have 100 as compared to 60 questions in 2 sections in past CAT years. 20 questions have been added in each of the two sections of test. Duration of the CAT 2014 has also been increased to 170 minutes from 140 minutes earlier. Now CAT 2014 new pattern will have a total of 50 questions for Verbal Ability section and another 50 for Quant section. However, the available information about the CAT 2014 new exam pattern is that it will have same 2 sections with no restriction to move from one section to another within the total frame of 170 minutes. CAT 2014 site has the icon to apprise about CAT 2014 new Exam pattern & Duration but all the ingredients are not yet shared. CAT 2014 new exam pattern is expected to have 4 different types of questions along with the questions on error corrections in sentences and paragraphs. CAT 2014 new exam pattern may place questions on single sentences divided in parts. Such questions were not asked in CAT during the past many years but they form an important type of questions on error correction. More questions on vocabulary usage are expected in CAT 2014 new exam pattern. Questions based on synonyms usage to fill in the blanks, instead of picking the incorrect usage of common vocabulary words, collocations, phrasal verbs questions could be framed to find the correct usage. Aspirants may find around 4-5 jumbled paragraphs which may include questions like ‘choose the opening and concluding sentence of a jumbled paragraph’ in the CAT 2014 new exam pattern. RC has so far occupied half of the Verbal Ability part with 10 questions. 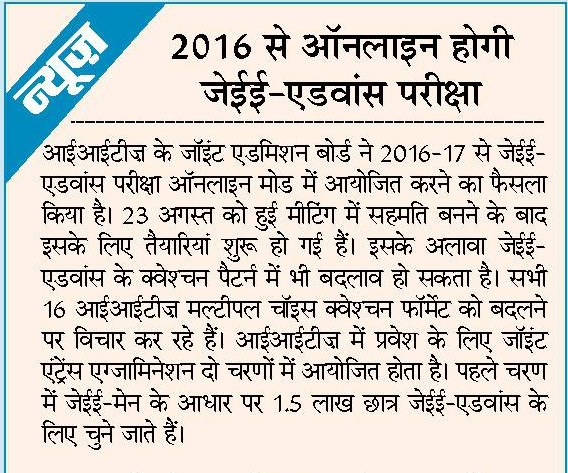 CAT 2014 new exam pattern is expected to have 15-16 questions based on Reading comprehension passages assuming that ratio remains more or less same. There could be more number of RC passages with similar number of questions based on them as have appeared in CAT 2012 & 2013. On a different note, the passages might have an increased length with more number of questions in CAT 2014 new exam pattern. The changes in CAT 2014 exam pattern are aspirant friendly. Aspirants have liberty to move from one section to other without any restriction. But again scanning the entire test paper with no target is not good. CAT 2014 new pattern has increased the overall time limit from 140 minutes to 170 minutes but average available time per question has been reduced from 2.32 to 1.70 minutes per question. under point No. 4 - Selection procedure. (POs) in Associate Banks of State Bank of India. Candidates selected are liable to be posted anywhere in India. recognised as such by the Central Government. of passing the IDD is on or before the eligiblity date. answers on the answer sheet (Offline) provided to them on Paper/Pen mode. “Test of English Language (comprehension, short précis, letter writing & essay)”. to be decided by the Bank. as per total marks in objective test. The examination will be held in the month of November 2014 (Tentatively). offered by individual Banks and on an average is about Rs.65,000/- per month at Mumbai. 1. Examinations for all the 22 papers will be conducted by an ONLINE Computer Based Test (CBT). The online examination paper will contain some questions for which numerical answers must be keyed in by the candidate using the virtual keypad. Rest of the questions shall be of Multiple Choice Question (MCQ) type. 2. Biometric information (Photograph and Fingerprints) for randomly selected candidates may be captured before the start of the examination. 3. GATE 2015 examinations will be held during forenoon and afternoon sessions on alternate weekends (Saturday and Sunday) between 31st January 2015 and 14th February 2015. Examination for some of the papers in GATE 2015 will be held in multiple sessions. Exact details regarding complete examination schedule will be notified at a later date. 4. For GATE 2015 the entire process of filling up of application form, uploading of certificates/documents, etc., will be online and the candidates should not send any hard copy of their application form/documents, etc., to any of the IIT/IISc zonal GATE office. 5. The payment of application fees would be online through different modes like net banking, debit/credit card, e-challan, etc. 6. The admit cards for GATE 2015 would be available through the online process only. Candidates can download their admit card from GATE 2015 website. No hard copy of admit cards will be posted to the candidates. 1. Application Process: For GATE 2015 all information related to the candidates will be available in a single GATE Online Application Processing System (GOAPS). Candidates have to register and fill the application via ONLINE mode ONLY by accessing the zonal GATE websites of IISc and any of the seven IITs. The photograph and signature of the applicant must be uploaded during the online application.Please note that all necessary certificates, such as, degree certificate/certificate from the Principal and the category certificate, if any are also to be uploaded. Please note that application forms are not available for sale anywhere else. have to enter a number as the answer using a virtual keypad. All candidates have to apply only ONLINE. Details of application fee for GATE 2015 The application fee is non-refundable. For GATE 2015 payments would have to be made through online by selecting either using any bank Debit Card/Credit Card, Net Banking or e-challan facilities ONLY. Additional charges will be applicable as per the rule of the bank from where the money is being transferred gives the charges as applicable for State Bank of India (SBI) and Axis Bank where the GATE 2015 account is opened and where the money is to be transferred. 1. Apply for the examination online. 2. Upload photograph, signature and other documents like graduation certificate/ certificate from Principal, caste certificate (if applicable) etc. 3. Pay the application fee through net-banking. 4. Check the Status of your application form: Received, Under Scrutiny, Accepted, Defect Status, Status after Rectification, Rejected with Valid Reasons, Admit Card Ready for Download, etc. 5. Contact the Zonal GATE Offices in case of any queries/problems. 7. View your answers, marks and GATE score. convenience, etc. The validity for CWE Clerks-IV will automatically expire at the close of business on 31.03.2016 with or without giving any notice. Educational Qualifications: A Degree (Graduation) in any discipline from a University recognised by the Govt. Of India or any equivalent qualification recognized as such by the Central Government. Penalty for Wrong Answers: There will be penalty for wrong answers marked in the Objective Tests. For each question for which a wrong answer has been given by the candidate one fourth or 0.25 of the marks assigned to that question will be deducted as penalty to arrive at corrected score. If a question is left blank, i.e. no answer is marked by the candidate; there will be no penalty for that question.